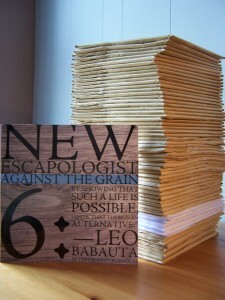 Copies of Issue Six are wending their way to our beloved subscribers. Rest assured, we’ve taken every step in motivating the postal workers of the world. The Postmaster Generals of every nation are currently being held in the New Escapologist oubliette and won’t be freed until all copies have been safely received. Apologies are due for the ridiculous gap between launch and distribution. A lucky few of you will have your copies already but this week sees the main wave of subscriber distribution. If you’ve not yet done so, you can order a copy at the shop. It’s no longer a pre-order. The stock is now ready to go. This issue—Against the Grain—celebrates everything in the vein of our mascot, Jean des Esseintes. Featuring Reggie Chamberlain-King on Leonard Dubkin; Aislínn Clarke on unorthodox funereal practices; poetry to commemorate office life by Graham Fulton; and lavatorial fun with Jon Ransom.